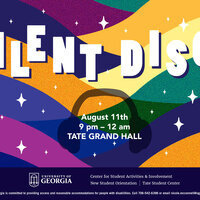 Join the Center for Student Activities and Involvement, Tate Student Center and New Student Orientation on to dance the night away with three different genres of music. *Headsets are limited in quantity. Entry is on a first-come, first-served basis. Welcome UGA is a campus-wide collaboration to provide students numerous opportunities in the first six weeks of the fall semester to meet new people, engage with departments and organizations, and learn more about UGA. Please visit welcome.uga.edu for more information and for a list of upcoming events.